A few years ago I took a variety of evening courses on of Persian & Greek history at Liverpool University. I’ve had a love of ancient history since my school days but this was a chance for me to indulge myself later in life. One of the hardest things about the course was writing the essays. It was hard get access to the right books etc. Ever since I’ve been keeping an eye out for Internet resources as I hope to do more courses later. Thucydides (ca. 460 BC – ca. 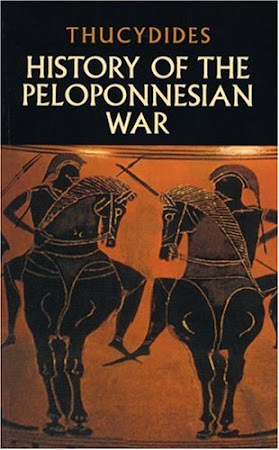 395 BC) was a Greek historian and author of the History of the Peloponnesian War, which recounts the 5th century BC war between Sparta and Athens to the year 411 BC. Thucydides has been dubbed the father of "scientific history" due to his strict standards of evidence-gathering and analysis in terms of cause and effect without reference to intervention by the gods. Thomas Hobbes’ 17th century translation is available online in both html and pdf formats at Online Library of Liberty. Benjamin Jowett’s 1900 translation is available online in a html format at Classic Persuasion along with some additional resources and tools. Personally, I bought a nice second hand copy to read the old fashioned way but it’s good to have the text available electronically for quicker searching and reference. How do you pronounce that? Is it Thuckee-dieds? The easiest thing to do is play the introduction from the audiobook to hear it spoken with an American accent.